Even though she passed away almost 20 years ago, Mother Teresa is still one of the most recognized and loved spiritual figures in the world. 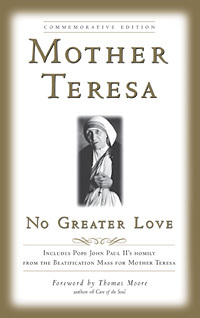 No Greater Love — the most accessible and inspirational collection of her teachings ever published — shares Mother Teresa’s intimate reflections on love, prayer, giving, service, poverty, forgiveness, and more. Originally published in 1996, it has been specially reissued to honor and celebrate her upcoming canonization by Pope Francis on September 4, 2016. We hope you’ll enjoy this excerpt from the book, about Mother Teresa’s perspective on work and service as a reflection of God’s love. It is possible that I may not be able to keep my attention fully on God while I work, but God doesn’t demand that I do so. Yet I can fully desire and intend that my work be done with Jesus and for Jesus. This is beautiful and that is what God wants. He wants our will and our desire to be for Him, for our family, for our children, for our brethren, and for the poor. Each one of us is merely a small instrument. When you look at the inner workings of electrical things, often you see small and big wires, new and old, cheap and expensive lined up. Until the current passes through them there will be no light. That wire is you and me. The current is God. We have the power to let the current pass through us, use us, produce the light of the world. Or we can refuse to be used and allow darkness to spread. It’s possible that in the apartment or house across from yours there is a blind man who would be thrilled if you would go over and read the newspaper to him. It’s possible that there is a family that needs something that seems insignificant to you, something as simple as having someone baby-sit their child for half an hour. There are so many little things that are so small many people almost forget about them. God will not ask how many books you have read; how many miracles you have worked; He will ask you if you have done your best, for the love of Him. Can you in all sincerity say, “I have done my best”? Even if the best is failure, it must be our best, our utmost. You may be exhausted with work, you may even kill yourself, but unless your work is interwoven with love, it is useless. To work without love is slavery. The fullness of our heart comes in our actions: how I treat that leper, how I treat that dying person, how I treat the homeless. Sometimes it is more difficult to work with the street people than with the people in our homes for the dying because they are peaceful and waiting; they are ready to go to God. You can touch the sick, the leper and believe that it is the body of Christ you are touching, but it is much more difficult when these people are drunk or shouting to think that this is Jesus in His distressing disguise. How clean and loving our hands must be to be able to bring that compassion to them! The more repugnant the work, the greater the effect of love and cheerful service. If I had not first picked up the woman who was eaten by rats — her face, and legs, and so on — I could not have been a Missionary of Charity. Feelings of repugnance are human. If we give our wholehearted, free service in spite of such feelings, we will become holy. Saint Francis of Assisi was repulsed by lepers but he overcame it. Whatever you do, even if you help somebody cross the road, you do it to Jesus. Even giving somebody a glass of water, you do it to Jesus. Such a simple little teaching, but it is more and more important. We must not be afraid to proclaim Christ’s love and to love as He loved. In the work we have to do it does not matter how small and humble it may be, make it Christ’s love in action. What have we to learn? To be meek and humble; if we are meek and humble, we will learn to pray. If we learn to pray, we will belong to Jesus. If we belong to Jesus, we will learn to believe, and if we believe we will learn to love, and if we love we will learn to serve. Spend your time in prayer. If you pray you will have faith, and if you have faith you will naturally want to serve. The one who prays cannot but have faith, and when you have faith you want to put it into action. Faith in action is service. The fruit of love is service. Love leads us to say, “I want to serve.” And the fruit of service is peace. All of us should work for peace. Strive to be the demonstration of God in the midst of your community. Sometimes we see how joy returns to the lives of the most destitute when they realize that many among us are concerned about them and show them our love. Even their health improves if they are sick. Mother Teresa (August 26, 1910 to September 5, 1997), also known as Blessed Teresa of Calcutta, was born Anjezë Gonxhe Bojaxhiu (meaning “rosebud” or “little flower” in Albanian). Since its inception in 1950, her order, the Missionaries of Charity, and its 400,000 sisters have opened more than 500 centers around the world to help the dying and destitute. Mother Teresa was the recipient of many of the world’s most prestigious humanitarian awards, including the Presidential Medal of Freedom, the Albert Schweitzer International Prize, and the Nobel Peace Prize. Adapted from the Commemorative Edition of No Greater Love. Copyright © 1997, 2001 by New World Library.